Plummeting temperatures midday today are ushering in thunderstorms and several days of below-normal chill that’s expected to last through late in the week — and may even bring snow on Monday. Showers and thunderstorms started to move into the southern part of the Chicago area by midday and were expected to hit most of the area over the course of the afternoon. As winds shift to the northeast, storms with frequent ground-to-cloud lightning and periods of heavy rainfall are expected. These extreme shifts in weather are exactly why Rogers Roofing, a Dyer roofing professional, makes it a point to educate their customers in Indiana about the importance of choosing the right roofing material. Not only should a roof be able to contend with exterior dangers, it should also be able to withstand interior threats as well. People ask a lot from their roofs without ever realizing it, which makes choosing the material a very loaded question. Can anyone imagine having to deal with the weight of a layer of snow on its surface when there’s a fire in the attic? It’s a very remote situation, but it’s one that roofers should anticipate when making recommendations for roof materials. Is there any material on the planet that can stand up to all of the expectations people heap on roofs? There are plenty, and it’s up to roofers to make sure their customers know all about them. Asphalt shingles, for example, account for 80% of the roofs in America. This is because they’ve been shown to resist fire and wind damage, as well as having enormous tear strength. Clearly, there are plenty of things that you need to know before you make a decision; let Rogers Roofing guide you down the right path and give you expert advice that you can rely on. 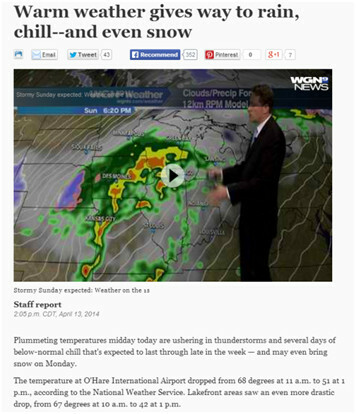 (Article excerpt from “Warm weather gives way to rain, chill–and even snow”, April 13, 2014).